A new Hanji craft tutorial video is now available! A new how-to video is now available on the HanjiNaty YouTube channel! This is the second how-to video, that shows you who to cut and glue the inner colours of a Hanji craft design. In the next few months, I will continue to create and upload new videos onto the HanjiNaty's YouTube channel, introducing the different steps of the creative process. If you have any questions, please do not hesitate to leave a comment below! Enjoy! Welcome to the HanjiNaty YouTube channel! I am excited to announce the creation of the HanjiNaty's very own YouTube channel! On this channel dedicated to Hanji crafts and Hanji paper, you will find tutorial videos explaining the different steps of the creative process, along with clips on Hanji paper making, Korean traditional culture, and other related topics. In the next few months, new videos will be periodically uploaded onto the HanjiNaty's YouTube channel, introducing the different steps of the creative process. Many people visiting or living in Seoul have been contacting me over the years to ask me where I buy my Hanji paper and supplies. Here are some of my favorite spots to find high-quality Hanji paper, tools and supplies. If you are looking for high-quality Hanji paper and Hanji craft supplies, I would recommend you head over to the Insadong district. Renowned for its lovely tea shops, art galleries and antique stores, Insadong is also a great place to get Hanji paper and craft supplies, as well as art supplies for calligraphy and painting. 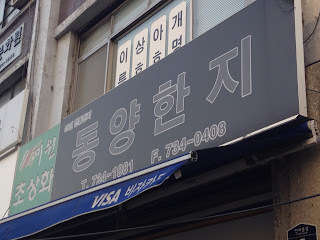 There are three specific shops that I like to visit when I go to Insadong: Doori Hanji (두리한지공방), Il-Shin Pil Bang (일신당 필방) and Dong Yang Hanji (동양한지). If you are looking for Hanji paper and Hanji craft supplies, your first stop should definitely be Doori Hanji. You will find this shop tucked in on the top floor of a narrow building, at the end of a steep stairway. Do not let this fool you; once you get up there, you're in Hanji heaven! Doori Hanji has a wide variety of Hanji paper, along with a great selection of tools, material and supplies, cardboard shapes, cut-out designs, souvenirs, etc. Everything you might need to start Hanji crafts can be found there. The owner is very friendly and speaks English; I have always been welcomed warmly there. The front section of the shop is actually a workshop where you can see craftspeople work, and many beautiful items are on display, including tea tables, cabinets, lamps, and many others. I have heard that some classes and workshops are available, but I do not have details regarding that. I would suggest you ask the owner when you visit the shop. - Cardboard shapes and kits to make countless types of items, including furniture, boxes, chests, tissue box cases, cell phone stands, hand mirrors, etc. Doori Hanji also has a great website where you can order supplies and paper: www.doorihanji.co.kr. It is my go-to page when I wish to order tools or materials to craft, and I couldn't be happier with the service and speedy delivery. Doori Hanji is open on weekdays from 9:00am to 6:00pm, and from 9:00am to 1:00pm on Saturdays. They are closed on Sundays. Take the subway to Jorong-3Ga (Exit 11). 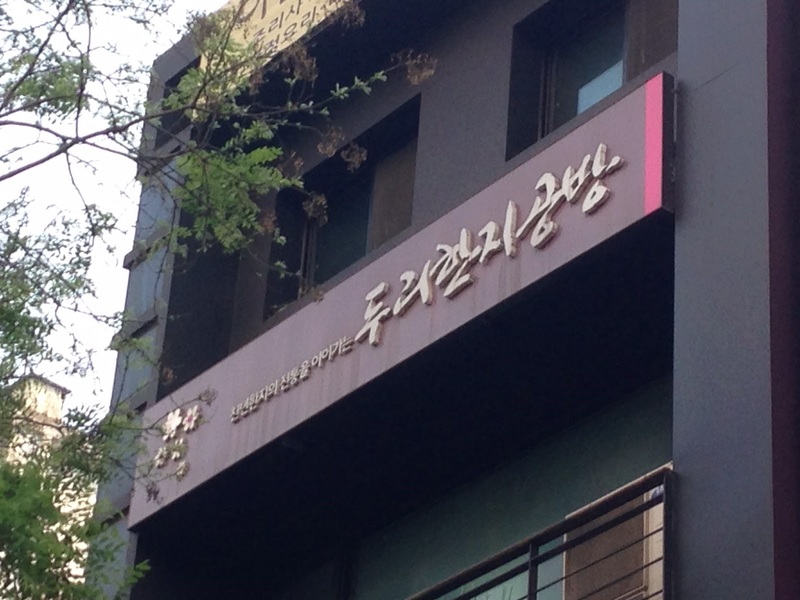 It's on the main Insadong street, across from the Insa-Korea souvenir shop. 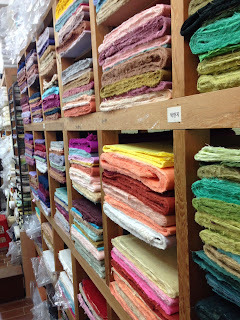 Another great place to shop for Hanji paper and Hanji craft supplies is Il-Shin Pil Bang. This store is located on the same street (the main Insadong street) as Doori Hanji, across from Starbucks. You can see the beautiful lamps hanging in the window. Il-Shin Pil Bang has a great selection of Hanji paper, along with tools, hardware, material and supplies, cardboard shapes, etc. It also sells calligraphy and painting supplies, which include brushes, ink stones and ink, paper, and scrolls. The couple who owns this business is lovely; they are always kind and helpful, and I always enjoy visiting their shop. Il-Shin Pil Bang also has a website where you can order supplies and paper: www.ilsindang.co.kr. 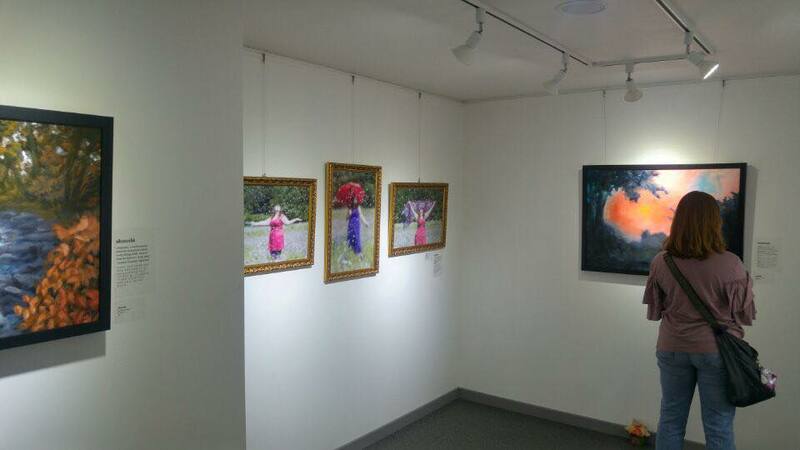 Il-Shin Pil Bang is open daily, from 10:00am to 7:30pm. The last, but not least, shop I would recommend is Dong Yang Hanji. What makes Dong Yang such a special place is the exquisite craftsmanship. Some of the paper you can find at Dong Yang is simply unique, not only in its quality but its originality. 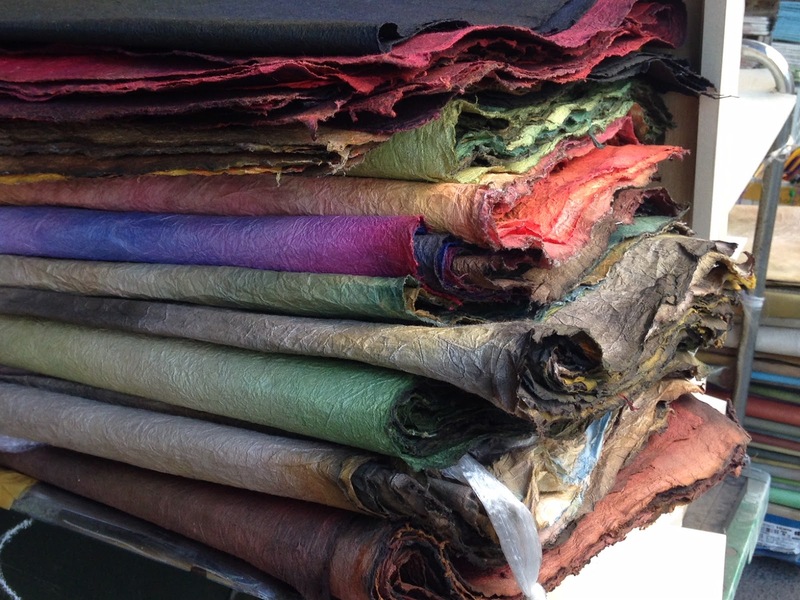 If you are looking for high-quality, handmade Korean Hanji paper, Dong Yang is the place to go. It is a rather small shop, filled to the rim with exquisite paper. The steep prices of certain items reflect their high-quality, so it isn't necessary a place for pure beginners. 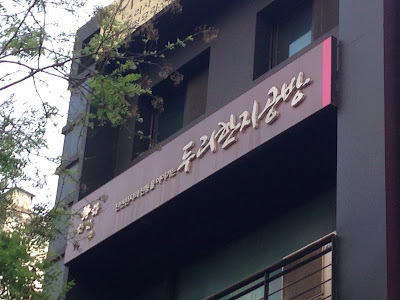 Dong Yang is located on the same street (the main Insadong street) as Doori Hanji and Il-Shin Pil Bang, on the ground floor. You can see piles of colorful paper and canvasses at the entrance of the shop. Dong Yang has a fantastic selection of Hanji paper, mainly handmade. 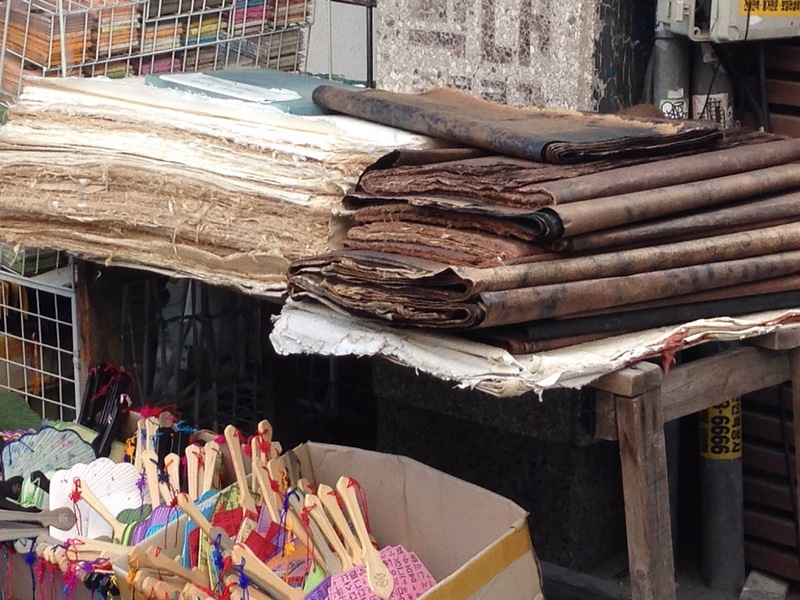 They also sell an assortment of plain-coloured and printed Hanji, along with hand dyed and hand woven papers. When you visit Dong Yang it's all about the paper; the owners aren't necessarily the warmest people, but the quality of their craftsmanship speaks for itself. 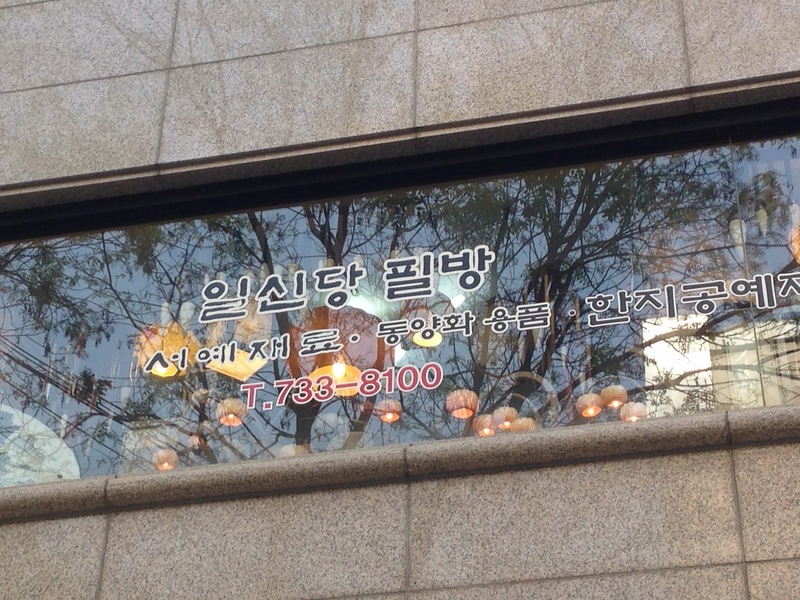 It's on the main Insadong street, two doors down from the 7/11 convenience store. Do you happen to know any other great places to purchase Hanji paper and Hanji craft supplies in Seoul? If you do, please do not hesitate to leave a comment to share the information with all the Hanji lovers out there! This year, the 22nd edition of the Jeonju Hanji Culture Festival (전주한지문화축제) will be held on the first weekend of May, from Friday, May 5 to Monday, May 7, which is a National holiday this year. The Festival program includes once again a Hanji fashion show, hands-on experiences, musical and dance performance, and the Hanji artisans' market. 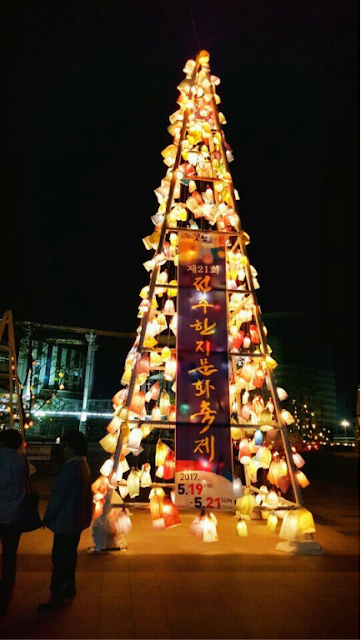 This year, HanjiNaty will not be participating in the Hanji Festival in Jeonju. We wish them great success for their 22nd edition! 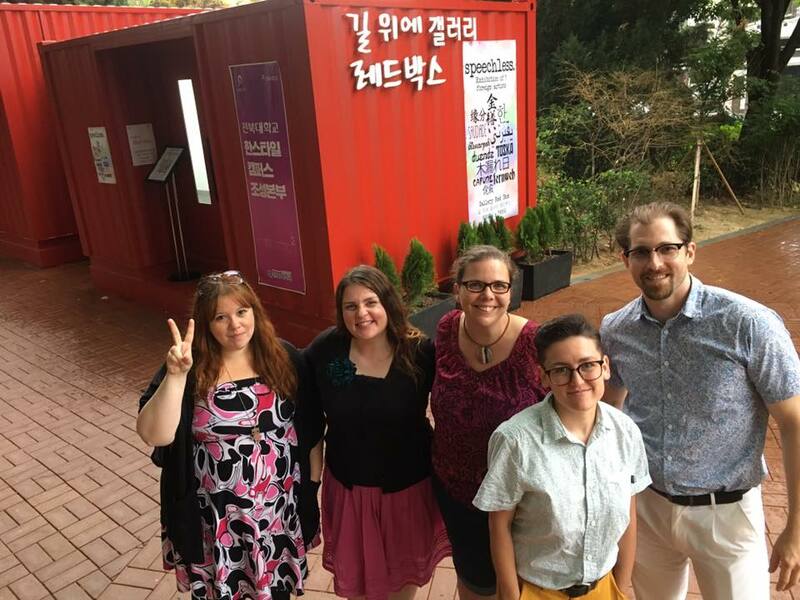 For more details, visit the Festival website (in Korean only): www.jhanji.or.kr. A very interesting and inspiring video about Aimee Lee, an Hanji artist from New York City who is an amazing ambassador of Hanji paper, and culture, in the world. 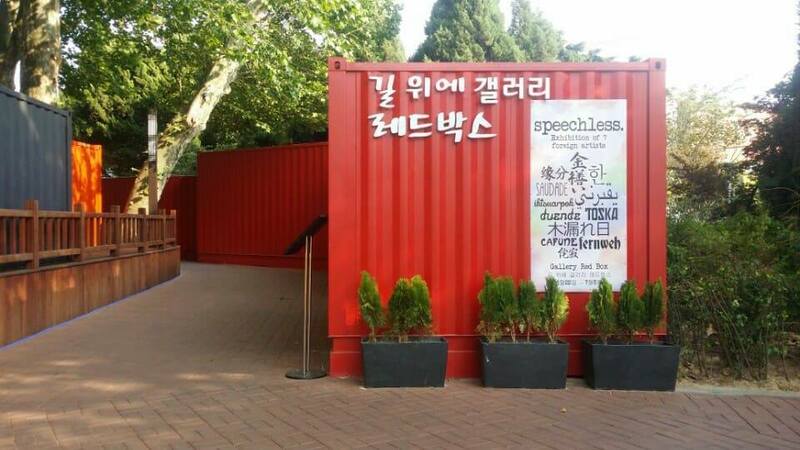 This month, HanjiNaty is taking part in a collective multidisciplinary exhibition titled "Speechless", presented at the RedBox Gallery in Jeonju, until July 5, 2017. 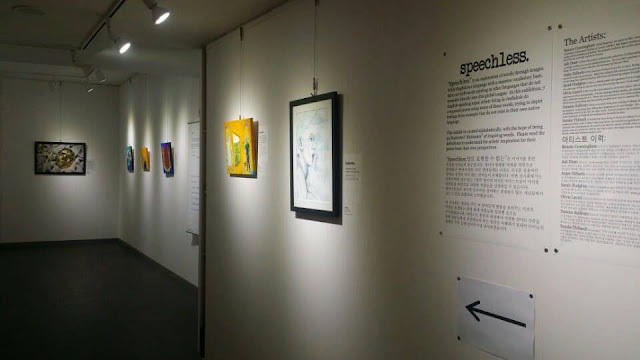 "Speechless" is an exploration of words through images. 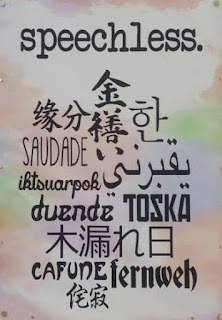 While English is a language with a massive vocabulary base, there are still words existing in other languages that do not translate directly into this global tongue. Foreign words, with no direct translation into English, are expressed through visual arts and poetry. On the left: "Yugen" created by Natalie Thibault (Hanji Naty). 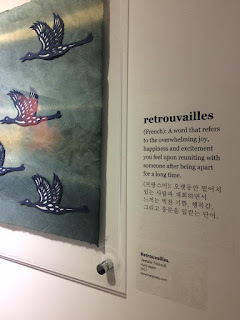 In this exhibition, seven English speaking expat artists living in Jeollabuk-do composed pieces using some of these words, trying to depict feelings from concepts that do not exist in their own native language. Bonnie Cunningham, Damien Sullivan. Absent from photo: Ash Dean and Sarah Hodgkiss. 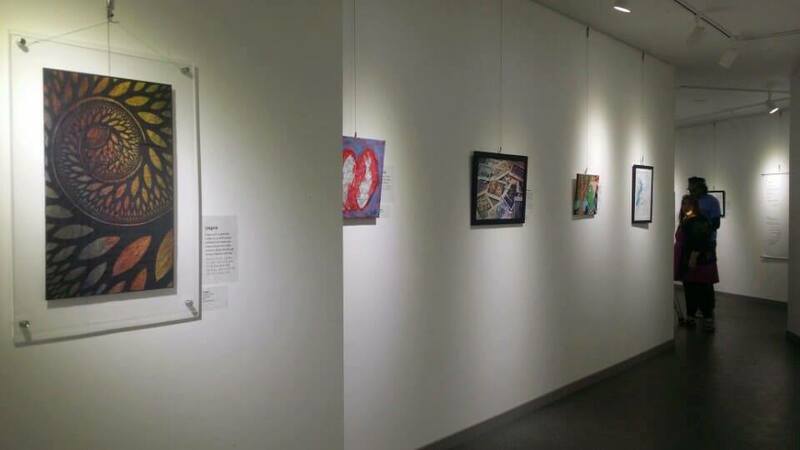 The show includes more than two dozens works of art: oil paintings, ink drawings, poetry displayed on traditional Korean scrolls, mixed-media artworks and, of course, Hanji paper cuttings. The artists were given the creative freedom to come up with any concept that the chosen foreign words inspired them. Some works are more evocative and symbolic, while others chose a more concrete approach. The "Speechless" exhibitions includes about 30 works of art, created by seven expat artists living in Jeollabuk-do. The pieces of art are displayed in alphabetical order, to present a sort of "creative dictionary" of the chosen foreign words. The visitors were then invited to explore this beautiful glossary, that goes from "Boketto" to "Yugen", in which they could read the original meaning of the words and let the artists take them into the special and unique world they created around or about every single word. 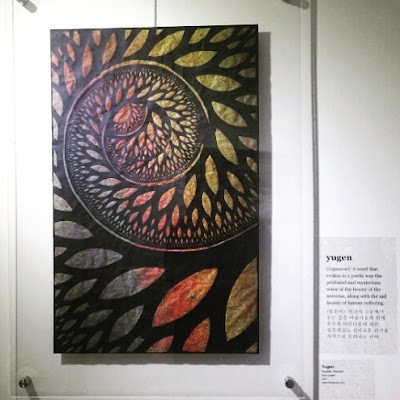 For this exhibition I created three pieces, inspired by Japanese and French words. 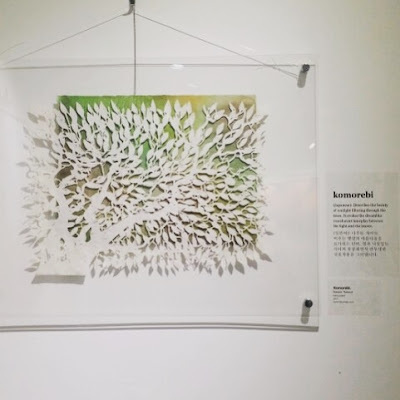 For the first time, I chose to display Hanji paper cuttings between two sheets of acrylic, rather than create a 3D object, such as a chest, a box or a lamp. I made the creative decision to let the paper speak for itself, and this new freedom led me to some incredible results. "Komorebi" is a Japanese word that describes the beauty of sunlight filtering through the trees. It evokes the dreamlike translucent interplay between the light and the leaves. sense of the beauty of the universe, along with the sad beauty of human suffering. and excitement you feel upon reuniting with someone after being apart for a long time. It was a very interesting experience for me to work on flat surfaces, rather than 3D objects. It allowed me to let the paper speak more freely, and it almost acquired a movement of its own. 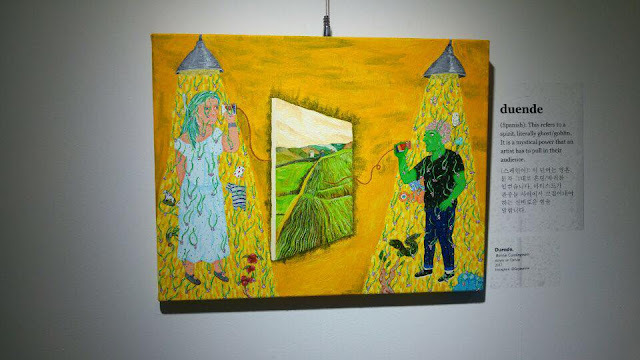 I would have liked to create more pieces for the show, but the lack of time forced me to limit myself to three artworks. I am hoping that new occasions will arise soon for me to create new pieces, inspired by other evocative and beautifully exotic words. RedBox Gallery is located on the edge of the Jeonbuk University Campus. 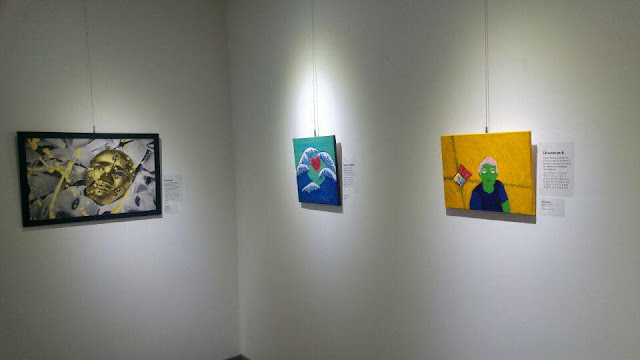 Left to right: "Kintsugi" by Anjee DiSanto, "koi no yokan" by Olivia Laurel, "Iktsuarpok" by Bonnie Cunningham. Amazing artists! What a joy to be part of that creative bunch! and "Tosca" (oil painting by Damien Sullivan). (Jeollabuk-do, South Korea). 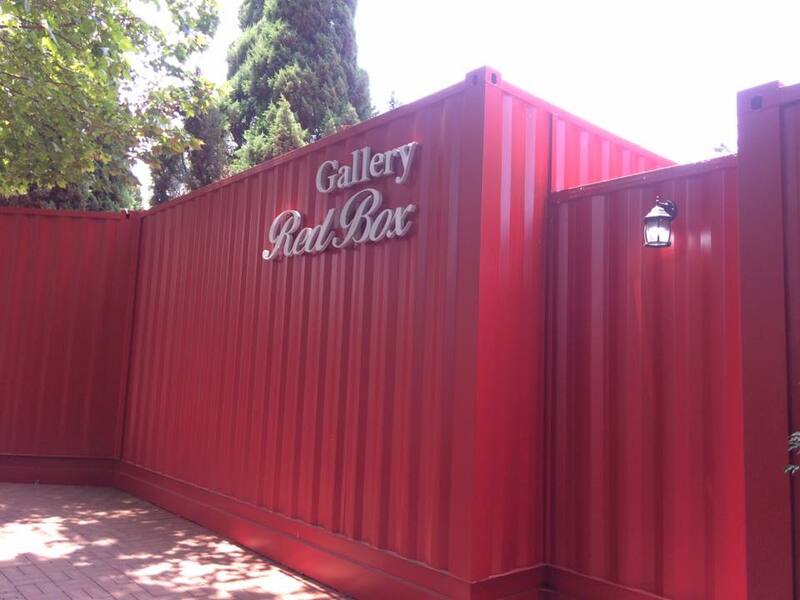 The exhibition is open from June 22nd to July 5th, from 10am to 6pm seven days a week. Admission is free. I really hope you have a chance to visit this truly unique art show! If you do, please make sure to leave a note in our guestbook. Enjoy! 2017 Jeonju Hanji Festival~ It starts tomorrow! 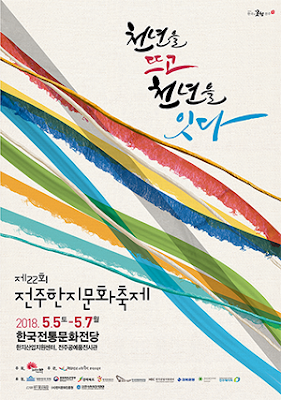 I am excited to announce that HanjiNaty will once more participate in the Hanji festival in Jeonju, in the province of Jeollabuk-do, South Korea! The 2017 edition of the festival will be held from May 19 (Fri) to May 21 (Sun), in two locations, downtown Jeonju. 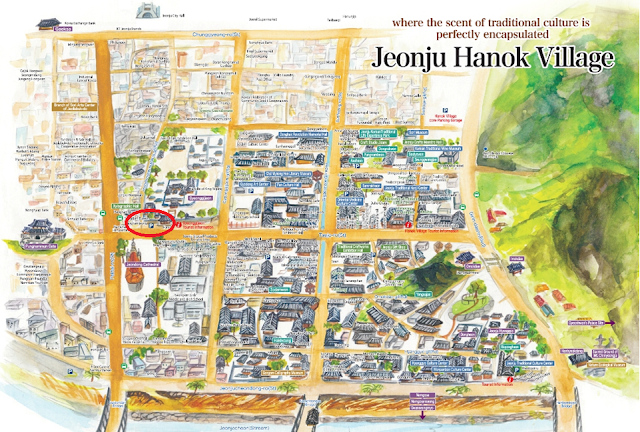 The core of the festival will once again happen in the site adjacent to the Korean Cultural Center in Jeonju, but a satellite location in the Hanok village will allow more visitors to enjoy what the festival has to offer. New! 2 locations for the festival! An exciting change will make the 2017 edition especially interesting! 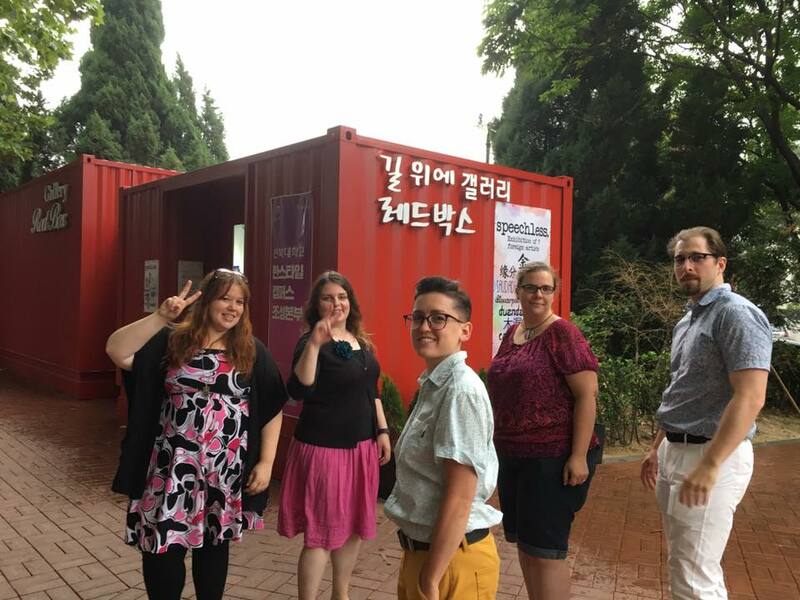 The festival will be held in two different locations: most of the activities will be held on the festival site (close the the Cultural Center) and a satellite market will be installed in the heart of the Hanok village, Jeonju's most popular neighborhood! The Hanji open market and the hands-on zone will be duplicated to accommodate more visitors. Paper and culture enthusiasts will have a chance to get to make interesting discoveries in both places, either by creating Hanji items themselves or by choosing to buy handcrafted items, unique gifts, or sumptuous high-quality Hanji paper. Once again the festival visitors will have a chance to enjoy an interesting variety of cultural events and activities on the festival site. Different performances will be given on the main stages, including the famous and popular Hanji fashion show. Visitors will also have a chance to visit the cultural garden, admire the Hanji sculptures and lanterns installed on site, including a giant Hanji paper tree that was recently erected. HanjiNaty will be in both locations for the long weekend of the Festival. Come to say hello and take a look at our selection of handcrafted jewelry (earrings, necklaces, brooches), hair accessories (hair pins, ties and headbands), and decor items, such as coasters, plates, cabinets, boxes and pen holders.